Bullfinches are plump birds about 15cm in length and with a typical wingspan of 24cm. The tails are slightly forked, and the legs are brown. 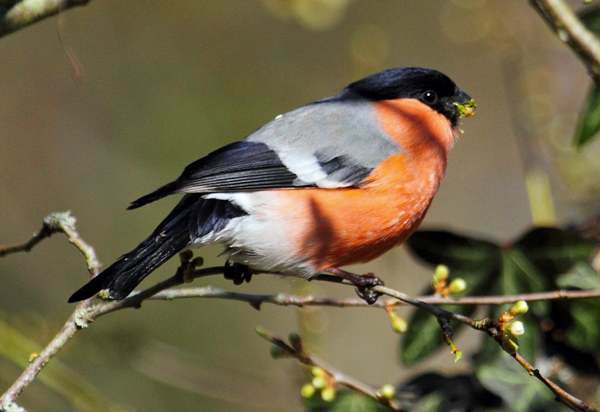 The male Bullfinch pictured above in its spring plumage is a peach of a bird. The females are paler pink, and the juveniles do not have the caps of the adults - glossy black in the case of the male and a duller black in the female. This lovely resident bird seems to be becoming rather scarce in many parts of the British Isles, but it can still be seen occasionally throughout Wales. Parks, farmland and large gardens, especially those with orchards, are Bullfinches' favourite haunts, and they seems to prefer thickets to tall trees. It is unusual to see a bullfinch on the ground. 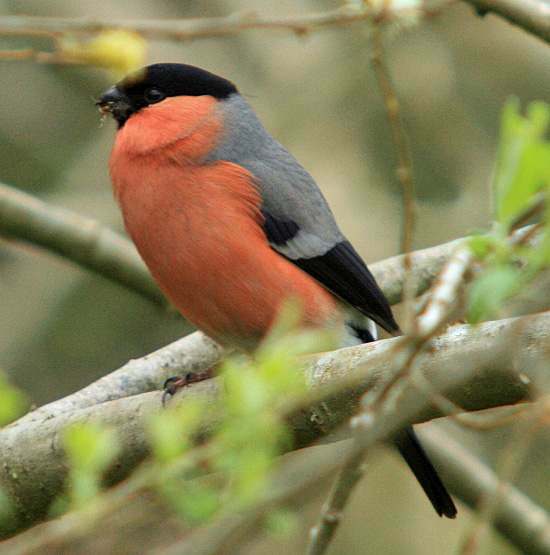 Bullfinches eat mainly seeds, berries and the buds and young shoots of bushes and trees. Fruit farmers are not fond of these beautiful birds because they eat the flower buds of cherry trees in particular as well as other fruits. In summer, Bullfinches supplement their otherwise vegetarian diet with various invertebrates including spiders and small insects. Being conspicuous when contrasted against a mainly green background, Bullfinches are vulnerable to avian predators such as corvids (such as Magpies) and raptors (for example Sparrowhawks), but habitat loss (particularly rooting out of hedgerows towards the end of the 20th century) might well have been a much more significant factor. Bullfinches make their nests, usually at or near to (human) head height, in hedges or on woodland edges low down in taller trees. For nesting material these birds (usually the females) gather small twigs, mosses and lichens, and the cup-like nest is lined with fine roots and hair. They lay typically four or five pale blue eggs that have purplish markings at one end. There maybe up to three broods in a year. Because of the recorded steep decline in Britain's breeding population during the last quarter of the 20th century the Bullfinch used to be a Red Lust species. There has been something of an improvement in recent years, and the Bullfinch is currently an Amber List bird of conservation concern. According to the British Trust for Ornithology (BTO), currently numbers are some 36 per cent below those recorded in 1967. The largest decline appears to be in farmland, whereas in parks and gardens numbers appear to have held up rather better.